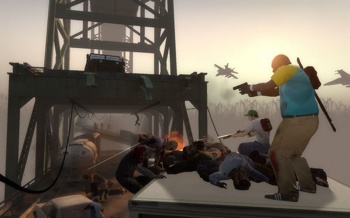 Valve fans worried that the Left 4 Dead 2 Boycott group might hurt Gabe Newell's feelings have formed a Steam Community of their own, the L4D2 Enthusiasts, with the aim of letting everyone know that the upcoming zombie thriller will in fact be awesome. Fair is fair, I suppose, and with over 32,000 members and plenty of media coverage for the Left 4 Dead 2 Boycott it was only a matter of time before some enterprising soul put together a group supporting Valve's decision to not take half a decade to put out a sequel to a hit game. Thus we now have the L4D2 Enthusiasts, otherwise known as Yes-L4D2, a group of gamers who are actually looking forward to the release of the new game. The site's founder makes a point of saying that while the group was formed in response to complaints about Left 4 Dead 2, it's not about simply trying to shout them down. "This isn't just a group created against the L4D2 Boycott group," the founder wrote on the main page, "it's also a group for Left 4 Dead 2 enthusiasts." With membership currently around 350, the enthusiasts have a long way to go to catch up to the boycott group and it's hard to say whether "we like Valve," which doesn't have a groundswell of anger to tap into, will be enough to attract comparable numbers. Either way, I'm hopeful, probably unreasonably so, that once the initial poo-flinging is over the two sides can actually discuss the upcoming game in a rational and productive manner. Wouldn't that be nice? Check out the Left 4 Dead 2 Enthusiasts group at steamcommunity.com.